I came across all these photos from a few years ago of Rivey and Scully the other day. Things have changed for them since we brought Ada home from the hospital over 2 years ago. It's not that they aren't still very much a part of the family, they certainly are. But their role in our home is different now -- and they have grown closer than ever as a result! Yeah, though I doubt they would admit it -- especially Scully -- they are best friends. That's not to say they don't occasionally still have their crazy ups and downs, like any siblings. They each have their own, very distinct personalities. Their own likes and dislikes. Their own food preferences. Their own petting preferences (Scully likes neck scratches, Rivey likes any rub we give him). Scully is certainly the more discerning of the two. She's always been grouchier, pickier, grumpier, and generally less satisfied. 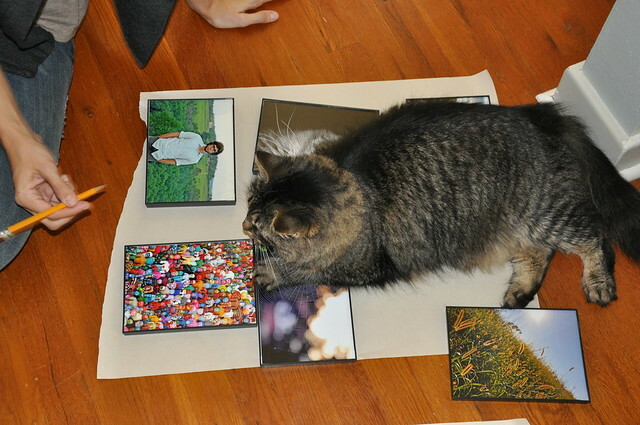 Though she's always willing to lend a helping paw with whatever we find ourselves doing. Rivey, on the other hand, is a lover. Of anything (and, well, everything!) that will give him the time of day. He loves sitting on our laps, making toys out of everyday objects, and sleeping long stretches on our bed in the afternoon. And he has a knack for finding the perfect, warm sun spots in our home. It's been a long journey to this point, though. I'd say they used to fight, well, all the time. It was a rough transition at the start, but they've moved past that stage and regularly snuggle together now. They play together and follow each other around the house. They even look out for one another, say, if one of them gets shut into a spare room -- the other waits right outside the door to let us know. Do your cats or other animals do that? Watch out for one another? Their distinct tastes peek through also through their taste buds. Since the last time I posted about these two, we've let them indulge in more SHEBA® Pate Entrées for Cats, Scully still loves the tuna, while Rivey has settled on his favorite: salmon. I love to give them a hearty meal made with meat-first recipes – using real beef, poultry, or seafood as the first ingredient. In addition, as healthy eaters ourselves, I also like that the SHEBA® brand formulates their meals without grains, corn, gluten, and no artificial flavors or preservatives. Only the best for these two! Do you have two cats? How do their tastes differ?